I'm working through this paper for a class. I'm a bit confused by the methods they used in one experiment. So the researchers are studying spine development in stickleback fish. They noticed some fish have spines and some do not. They have a good hunch that spine development is under control of PitX1. They work out through cross breeding spined/non-spined fish that spine development is regulated in cis. "To further localize the position of the cis-acting changes, we looked for the smallest chromosome region co-segregating with bilateral absence of pelvic structures in a cross between pelvic-complete (Japanese marine (JAMA) and pelvic-reduced (PAXB) fish, 13). High resolution mapping identified a 124kb minimal interval, containing only the Pitx1 and Histone 2A (H2AFY), genes, which showed perfect concordance between PAXB alleles and absence of the pelvis"
The attached picture is the accompanying figure, where part A refers to this experiment and part B refers to a promoter bashing experiment later. I have no idea what it means to "look for the smallest chromosome region co-segregating with bilateral absence of pelvic structures in a cross between pelvic complete and pelvic reduced fish". I assumed they did at QTL mapping, but spines appear to be a mendelian trait. Since QTL mapping is done on polygenic traits, it wouldn't work. Could anyone shed some light on this experiment? 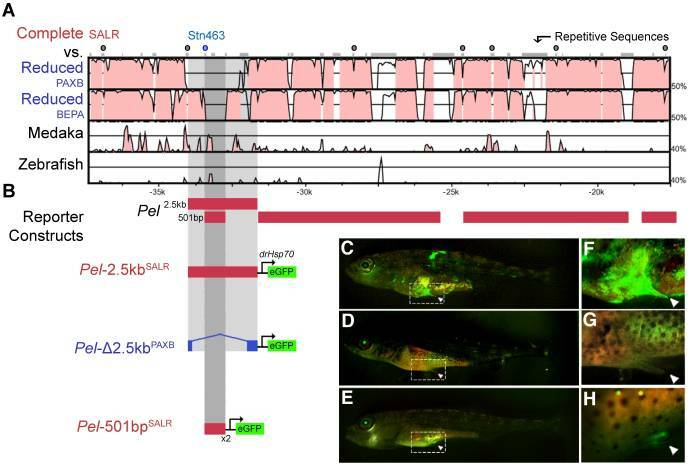 It's captioned: "(A) VISTA/mLAGAN alignment of Pitx1 candidate region from pelvic-complete stickleback (SALR), medaka and zebrafish. Red peaks, >40% sequence identity in 20bp sliding windows; grey bars at top, repetitive sequence; An external file that holds a picture, illustration, etc. Object name is nihms-215525-ig0003.jpg symbols, microsatellite markers ..."
Browse other questions tagged molecular-biology molecular-evolution or ask your own question. How far in evolutionary distance is the P-distance estimator “accurate”?